The fall sports season is in full swing which means that the winter sports are ramping up and getting ready for action. Larry Shyatt’s Cowboy basketball team is ready for another battle in the Mountain West. Joe Legerski’s Cowgirls are picked to finish second in the Mountain West this year. Then there’s Mark Branch’s Wyoming Cowboy wrestlers. The wrestling team seems to be often overlooked in the midst of Wyoming athletics but there hasn’t been a team with as much success as Cowboy wrestling. Year after year All-American’s are born on this team and national rankings and high quality opponents litter the Cowboys’ year. Mark Branch is entering his sixth season with the Pokes and he’s quickly building a dynasty. A dynasty that Wyoming athletics desperately needed. Last season the Pokes entered the season with some holes to fill after the departures of three of the most successful wrestlers in Pokes history, Joe LeBlanc, Michael Martinez, and Shane Onufer. LeBlanc was the first four time All-American in Pokes wrestling history. 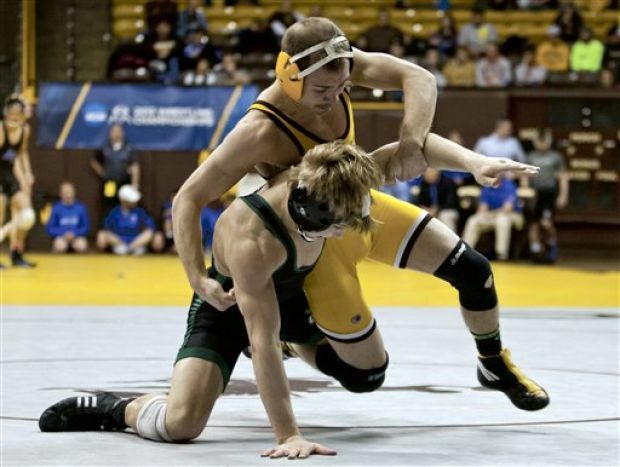 The Pokes responded by taking out Pac12 rival Boise State in the first dual of the season. The Pokes season was highlighted by a 9th place finish at the Cliff Keen Invitational and a win over nationally ranked Oklahoma. At the NCAA tournament the Cowboys finished 23rd, only the 17th time in school history the team has finished in the top 25. The team also produced two All-Americans in Tyler Cox and Alfonso Hernandez. Tyler Cox, a Gillette native, will be back to try to make it two in a row to be an All-American while Alfonso Hernandez will be a graduate assistant for the team. Under Branch the Cowboys are 26-2 in the Western Wrestling Conference with three regular season titles. That’s a terrific run. What does this season have in store for the Cowboys? A few new faces for starters. Cox will return at starter at 125 pounds. At 133 Drew Templeman and Sean O’Leary will battle it out. 141 will have Cole Ford, Kyle Komata, and Cole Mendenhall battle it out for the starting spot. Komata was the starter much of last year. 149 looks like it could be between Robert Stroh and Brandon Richardson. At 157 Andy McCulley, a Rock Springs native, held down the starting spot last year and made an appearance at the NCAA tournament. Leading the pack at 165 is returning starter Dakota Friesth, but could be challenged by Oklahoma State transfer Dallas Bailey. The 174 pound spot could be heavily contested by a group of VERY young wrestlers, all of whom are freshman. Brent Havlik was redshirted last year and competed very well in open tournaments. The 184 lineup could be an interesting and exciting weight to watch this year as returning starter Shane Woods, who was an NCAA qualifier will be duking it out with youngster Ben Stroh who had a terrific year as a redshirt and went 3-2 in the FILA Junior Nationals. 197 pounds will be full of youth, just like 174.. could Stroh, Woods, or Leland Pfeifer move up? Maybe. Leland Pfeifer, if you remember, put his team before himself last year and moved up from his 184 spot to heavyweight to fill in a hole for the Cowboys and put out a terrific effort and got a 3rd place finish in the WWC championships. At heavyweight it looks like the Pokes will rely on Tanner Harms, who started the year well but was slowed down with an injury that kept him out for more than half of the season. That looks like a really solid lineup with a lot of young wrestlers on the roster that will provide good competition in practice and keep the future bright for Cowboy wrestling. This year’s schedule is a good one, the Cowboys will travel to Boise State and Minnesota, then compete in the Cliff Keen Open in Las Vegas. The Cowboys will then host Oklahoma State, then travel off to Oregon State, then compete in the Reno Tournament of Champions. That’s a solid schedule happening before Christmas. After Christmas the Pokes will be at Nebraska, then host Oklahoma. The Pokes will host South Dakota State, Cal Poly, Northern Colorado, and Utah Valley State in WWC dual action. This is another terrific schedule put together. As far as pre-season rankings go, Tyler Cox is ranked 5th or 6th by four different publications. Also making appearances are Andy McCulley (13th to 20th), Dallas Bailey (11th to 15th), Shane Woods (26th), Brandon Richardson (18th), and Tanner Harms (32nd). WIN magazine has the Cowboys checking in at 28th in the team standings. This team is built for better than 28th. The Cowboys will open up action on November 2nd at the Cowboy Open before heading to Powell, WY for the Northwest Open on November 9th. A good chance for the residents of Northern Wyoming and Southern Montana a chance to see the Pokes in their neck of the woods.